- Three arms can be adjusted in any direction. - Serge Mouille designed his angular, insect-like lights as "a reaction to the Italian models that were beginning to invade the market in 1950," which he criticized for being "too complicated." 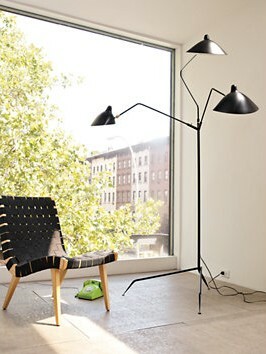 His large-scale Three-Arm Floor Lamp (1952) has a kinetic, sculptural aesthetic that evokes a sense of movement in space. 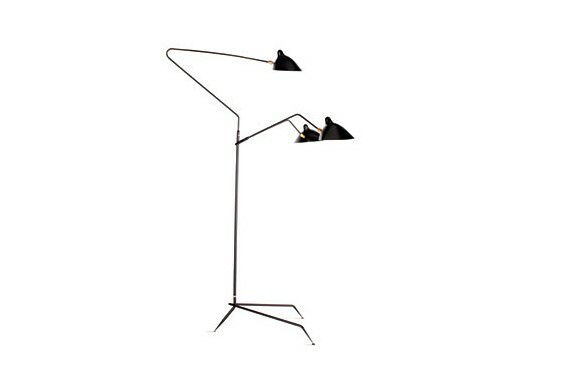 All of the arms can be rotated in various directions, allowing for ample, well-directed lighting for any task. 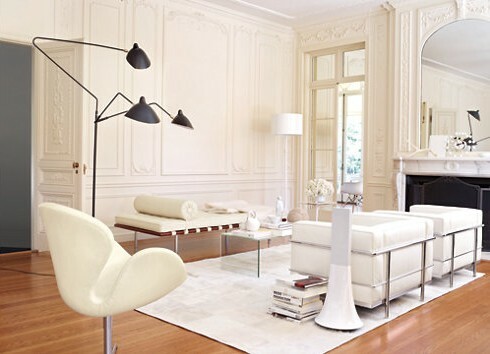 Mouille designed the Three-Arm Lamp for a client whose instructions were simply, "I want a big light because I have clients in South America who have huge rooms." All of his lighting solutions feature Mouille's hallmark signatures as a designer: the way the arms are joined to the diffusers, the washer and six-sided screw hardware, the form of the reflectors, and the refined lines of the steel tubing.